Hi I am MooCow. 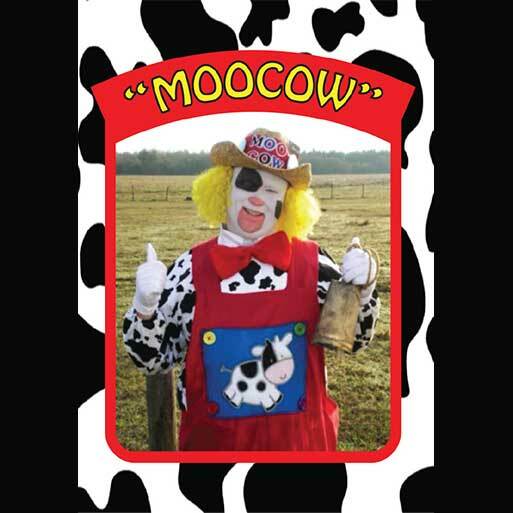 A fun fact about my clown name is that I have been called MooCow since I was a baby. My real name is Michael and during baby talk with my Dad he started calling me MooCow. Growing up I asked him not to call me that in front of my friends but in high school my cousins and close friends started calling me it also and then it just seemed to grow. Since then, everywhere I go, I am simply known as MooCow, for example, I am a Coast Guard Veteran and some guys at the station didn’t even know my real name when my wife called one night asking for “Michael”. MooCow is a totally different kind of clown. In the clown world, character clowns usually portray people but since I am an animal well, like I said MooCow is totally different. I consider myself a clown’s clown, I am not really great at any clown stuff. I can do some of it but I enjoy getting down on the kid’s level and making them smile. I love when a kid that is scared of clowns find out that real clowns are not scary but friendly, that kid has a great time with us and ends up loving real clowns. I joined Egypt Shrine at the end of 2006 and have been in this unit since the beginning of 2007. I am lucky to have the love and support of my wife and daughter with the amount of time I enjoy giving. I have been on the board, President, VP and since 2016 the Boss Clown of this unit. It is an honor to be in this position. The guys of this unit are so talented, they really love to clown, and give back. The clowns are more than just another unit, they are my family. That’s all for now, it’s time I Moooooove along.